Because of the sensitivity and criticality of accounting and financial data, more and more companies are moving their accounting software and data to the cloud. Additionally because the clouded environment allows remote access, cloud accounting increases efficiencies allowing company bookkeepers to access data and reports from anywhere with an internet connection. Total Merchant Network has found that this not reduces the costs when it comes to filing taxes, but also reduces the additional manual labor necessary to input data for day-to-day transactions. The reduction of non-value added activities and improved efficiencies lead to lower costs and improved cycle times. 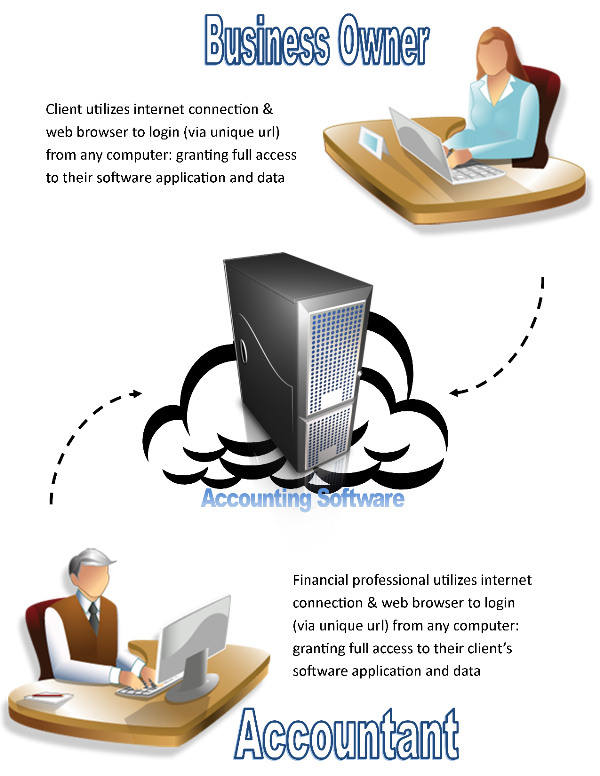 The diagram below depicts an example of how cloud accounting works with a sole owned or small business owner and their external financial professional such as an accountant. Many estimates show that small business owners in the previous example will save over $1,000 annually on data backup and CPA travel time alone. This does not include the peace of mind gained by having a remote professional a phone call away as well as automated software updates. New or existing businesses that are not currently utilizing account software will also gain the benefit of a new software installation by a professional (software cost additional). 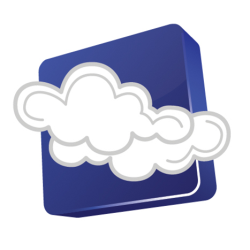 For those businesses that already have an accounting software locally or online, cloud providers will assist in the data transfer process. The diagram below depicts a larger organization that has many employees filling various roles. Larger organizations typically already host their data remotely or have a server onsite. The benefit in moving their accounting application to the cloud is the reduction in cost achieved but lower IT and server maintenance costs. These savings can get into the tens of thousands of dollars annually or more depending on the size of the organization. An efficient and effective data migration process is available for those organizations that fit into this category. 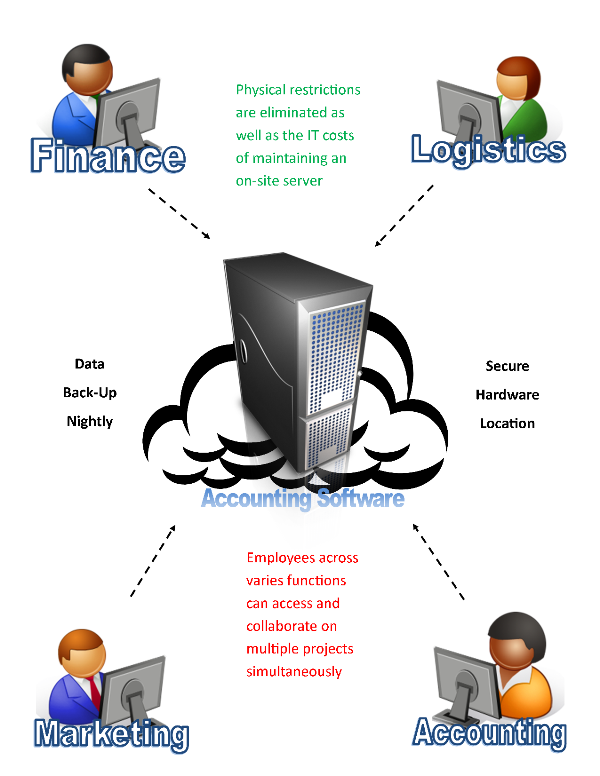 Which Accounting Applications can be Hosted in the Cloud? Total Merchant Network understands that second to accepting payments, tracking business data associated with financial accounting is the most critical activity related to commerce. If a business is not currently implementing a regular accounting process with a formal method such as accounting software, they should being this process immediately. For those who are already actively engaged in the accounting process and still do not see the necessity to host in the cloud, Total Merchant Network offers a 30 day FREE trial to help change your perspective. Total Merchant Network forecasts all applications in the not too distant future to be cloud based and seeks to be ahead of the curb in all of its merchant offerings. If you would like more info before applying contact us at 503.862.8541 or Click Here.